History: Cheatgrass is a winter annual that is native to Eurasia. It was first introduced into North America between 1850 and the late 1890's. It was brought here by contaminated shipments of grain seed, straw packing material, and soils. At the time cheatgrass was brought over to North America, rangelands were being abused and a severe drought was in the making. During the drought, native vegetation was being reduced and cheatgrass was able to take over and out-compete the native plants. It can be found in a wide range of environments from the bottom of a desert valley all the way up to peaks at 13,000 feet. Roots: Cheatgrass has an extensive root system. It has wide-spreading lateral roots that are key to the plants survival. The root system has the capability to reduce soil moisture to the permanent wilting point to a depth of 70 cm. Stems and Leaves: Cheatgrass has a wide range of stem sizes varying from three to 30 inches in height. The leaves emerge dark green with a hint of purple. As the plant matures, it turns to a dead-looking yellow color. Flowers and Seeds: Cheatgrass has a crooked seed head and small soft hairs covering the entire body of the plant. At maturity, seed heads range in size from two to six inches long. The seeds have wedged awns that can be dispersed by wind or water but mainly by clinging to clothing or the coats of animals. Methods of Reproduction: One plant can produce up to 300 seeds. Seeds can remain viable in the soil for up to 11 years making it very hard to control. The seeds can reproduce in high temperature soils and germination is the best in the dark. Environments Favorable for Infestation: Cheatgrass is found in almost any type of environment and will grow in almost any type of soil. Cheatgrass is most commonly found in low foothills and prairie settings. It is often found along roadsides and disturbed areas such as construction, fires, floods, poor grazing activity and intense recreation areas. 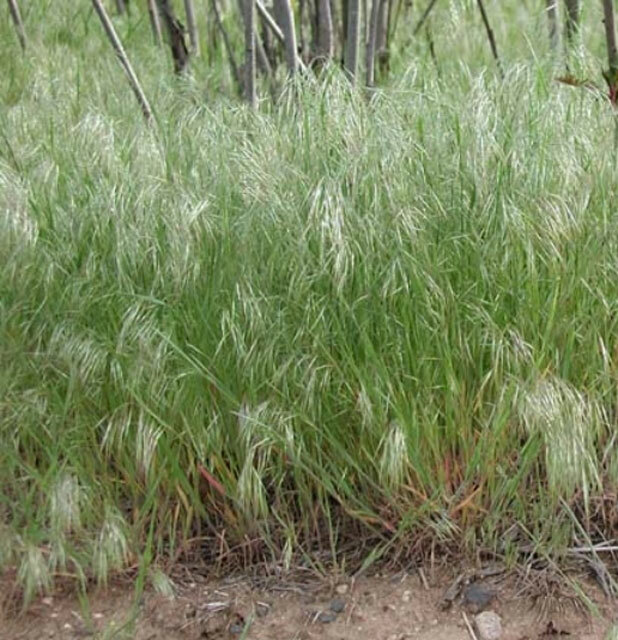 Environmental Impacts: Cheatgrass is notorious for out-competing native plants because of its ability to survive in any environmental condition. It also can change soil properties, have a decline in agricultural production, and altered fire frequencies. Cheat grass is a highly flammable plant and densely growing populations provided ample fuels for grass fires. Research seems to show that cheatgrass is causing hotter fires more early in the fire season in the western U.S.
Prevention: Do not spread the seeds by vehicles, clothing or pets. It seems to stick to everything so be careful that you don't bring seed with you and contaminate other environments. Mechanical: Hand pulling can be used in the spring and fall but is only effective in small areas. Disking and tilling can be done in the spring and fall before the seed heads turn purple. Biological: Currently there are no biological control insects approved for release right now. Livestock grazing can be done heavily in the early spring when the grass is green before the plant goes to seed. Fungus is being researched. Chemical: Chemicals such as roundup or plateau can be used to kill cheatgrass, but before you use any chemicals be sure to check the labels to make sure they list cheatgrass. Combinations of herbicides may be required to control your infestation. Other: In the late spring or early summer, prescribed burns can be done but under supervision of the fire department. There is a risk that it could turn into a large wildfire.